Fresh, insightful and informative stories from the Norwood News are online and on the streets now. 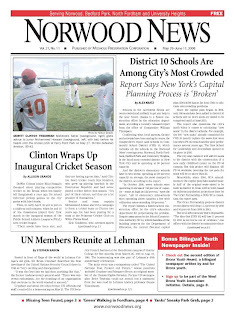 Find out what's going on in Norwood, Bedford Park, North Fordham and University Heights with one click. Confirming what local parents, students, activists and local officials have been saying for years, a new report outlines the overcrowding problems in local schools. District 10, which includes all the schools in the Norwood News coverage area is the third most crowded district in the entire city. In that same vein, Bronx schools are lacking facilities for proper physical education, says a new report by the Bronx Borough President's office. A missing Celia Cruz Bronx H.S. of Music went missing and then was reunited with her family eight days later. What happened to her remains a mystery. Cricket Mania: The Norwood News explores the inaugural high school cricket season. Plus, Mt. Hope Monitor editor and cricket fanatic James Fergusson explains why cricket is really the world's best sport and dissects all it's nuances. And much much more at the Norwood News' award-winning Web site.